Friday (after coming up with a new game plan since the movie theater saw fit to ruin our original plans) turned out as a great day. Peggy and Sandy were in town for the day for a cousins graduation and we spent the entire day hanging out and running around. 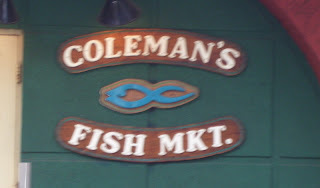 First stop, Coleman's Fish Market. Its housed in historic Centre Market section of Wheeling and is probably one of the few places left that does not take debit or credit cards. They don't need to, people come from all over the country for a fish sandwhich here. On any given day, you will stand in line for a fish sandwhich, even at 10:00 in the morning. I don't know what it is, fish never tastes as good as it does fried and slapped between two pieces of Wonder Bread. I know it doesnt sound like anything special, but you really have to try it. It was beautiful out so we were able to eat outside and just enjoy the day. Afterwards we went into the upper market house for the best piece of strawberry pie I have had in ages. Then it was on to the movies to see The Incredible Hulk! I have to say, I was a tad bit salty from the previous night. But no fear, I took to the internet and complained on the theaters site. Which is something I rarely do. I was pissed though! However, because we were on a tight time schedule, I sucked it up and ended up back at the same theater. The movie was wonderful! I was not disappointed at all. The effects were phenomonal and Edward Norton did a great job. Robert Downey Jr. also makes a cameo at the end. One of my friends, who wasn't all that crazy about going to see the movie, enjoyed it as well. Definitely a summer must see! I hope every one had a great weekend and a HUGE Happy Birthday to Melanie who celebrated the big 2-1 today! Don't tell anything more! I have to go and see it! Everyone makes fun of Midwest food, but you know as soon as they get the chance they are in line for a fish sandwich, deep dish pizza or a Chicago style hot dog. First of all, the weather must be nicer, as you sound much "lighter". I hope that is the case. Sun is such an upper. Especially when you can eat "al fresco". I want to see the Hulk too. Asa loves the trailers on TV, however, he tell's me it's not age appropriate and he shouldn't see it, but he LOVES the hulk toys. Figures. I've heard really good things about the movie so I'll have to check it out. I heard about Robert Downey Jr. cameo which is genius. Just saw Iron Man.